We’ve got a Hammett tour coming up fast, where anyone can show up palming twenty bucks and walk the walk — this Sunday, January 18. Next one in line rolls up on Sunday February 22. Meets at noon, near the “L” sculpture. Ought to take four hours or slightly longer. If interested, just show up with $20, comfortable shoes, and a cynical world-weary attitude coupled with a line of quick patter. Gumshoes will travel, rain or no rain. 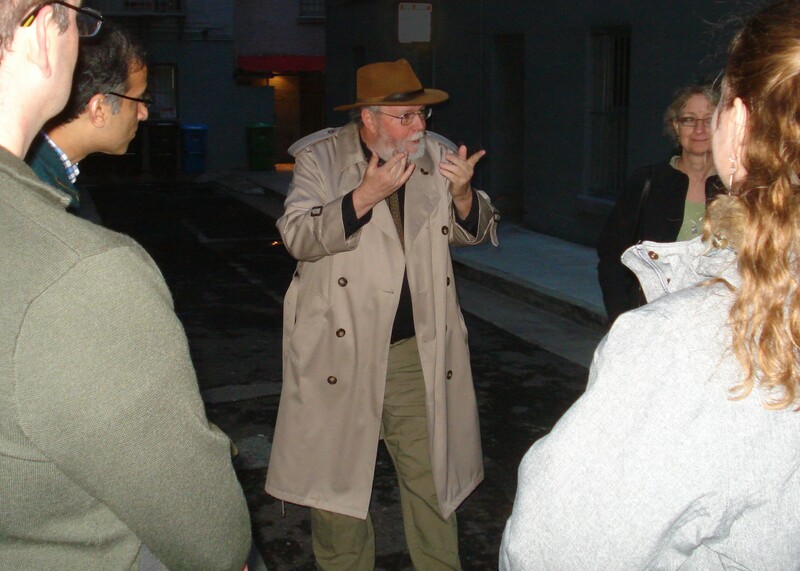 Image above: the tour near the spot where Miles Archer, partner of Sam Spade, took a tumble in Burritt alley. This entry was posted in Tour and tagged Burritt alley. Bookmark the permalink.